When DC rebooted Supergirl in their New 52 series, among other things, people complained that she was too ‘emo’ rather than her sweet and happy counterpart found in previous versions of her. Originally, I was attracted to her in New 52 because the costume was interesting and unique compared to the other versions of Supergirl in the past. I read all of the comics and I don’t particularly see the problems that many others see. I think the reason behind my disagreement with criticism is that as a transgender woman, I relate to Kara in a lot of ways. Her first steps on planet Earth are greeted with humans in metal suits treating her like a threat. She’s a stranger in a strange land and unlike her cousin who was raised on this planet from a young age, she comes from entirely different world with different language and culture. Similarly, when I was in my late 20s, I was struggling with the realization that I was transgender. Up until that point I had lived in the ignorance that I just needed to ‘man up’ my whole life. I had a lot of friends that were girls but I was never fully accepted among them as one of their own. Meanwhile my masculine peers were also not where I felt comfortable. It’s no wonder I felt mostly introverted and buried myself in MMORPG video game worlds. You could almost say I was locked away in a space pod for many years. When I did finally start to discover myself, I started to understand why I felt foreign in my body and in my world and those around me fought my transition at every turn. My wife divorced me and my parents disowned me. I went through foreclosure and bankruptcy and was forced to not only start shaping my new body (hormones, surgery, etc) but also completely creating a new life for myself. Kara experiences this too when she crash lands onto Earth. She’s disoriented and confused, her family is nowhere to be seen, and she doesn’t know what is going on or how to use her newfound powers. 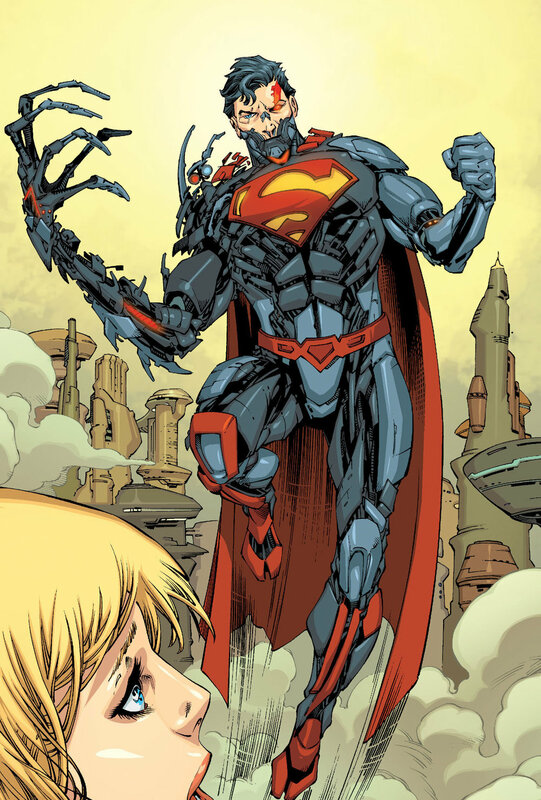 Later on in the New 52 series, Kara comes into contact with someone who ends up being her nemesis: Cyborg Superman. As the readers, we find out before she does that he is actually some patched together form of her father, Zor-El. The parallel with Cyborg Superman and my own father struck me quite painfully. He and I were very close growing up and he was essentially the role model I looked to when I was trying to be a man. I looked up to him a lot and when I was a married man, we had a lot in common and considered ourselves ‘best friends’. Finally there’s the Red Lantern phase of Supergirl. The Red Lantern Corps harnesses the emotion of anger through their red rings (different from their green brothers who use willpower). Kara is chosen to wear the red ring and it becomes a platform for her to express her anger for her situation. In general, anger is an interesting emotion. I’m told that it is not a primary emotion but instead secondary, playing off of other emotions such as disrespect, fear, guilt, anxiety, etc. In the same way I have my own righteous anger at my parents, at the world, at God. Why did this happen to me? Why did my parents abandon me? I’m sure these are also questions Kara struggled with and eventually her frustration led to an abundance of anger. Yet throughout all of these trials and tribulations that Kara and I have both been through, we both still pine after our parents. Questions we ask ourselves are very similar. Why did they abandon me? Why couldn’t they come with me on this journey? I suppose the clear difference is that Kara’s parents were lost in death while mine are simply lost in ignorance. Therefore maybe one day, my parents can find their way out of their ignorance and come to appreciate and love their newfound daughter with superpowers.